Here’s a remarkably mixed message. 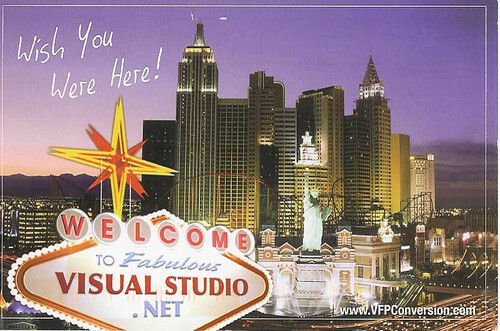 What are the advertisers trying to tell me in this postcard I just received? Post your favorite theories in the comments! Visual Studio.NET is a gamble? VS.NET is trying to look like something it’s not? It’s just like the City of Lost Wages! Bet your career! “What happens in DotNet, stays in DotNet” — unbelievably, it actually says this on the back of the card! Amazing.